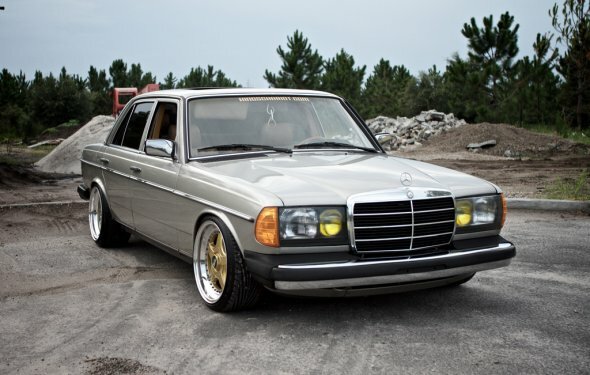 This 1982 Mercedes-Benz 300D is a 5-speed manual equipped, 5-cylinder non-turbo diesel car originally purchased in Germany before being brought to Canada by the original owner. 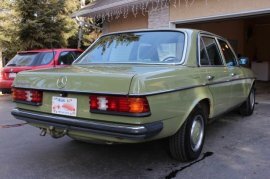 Fitted with a number of interesting options not usually seen in the US, including a cloth interior with manual windows, this Euro-market car is also equipped with w123 wagon rear springs and a Euro trailer hitch. The car shows 345k kilometers (~215k miles) and is sold with a clean Alberta title in the seller’s name. 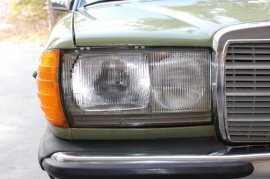 Finished in Caledonian Green, this higher mileage w123 shows well in photos, though per the seller flaws consistent with its age are apparent up close. With slim European bumpers and aero headlights the car looks sharper than US-market cars of the same period. The seller has fitted new tires and has been using the car as a daily driver. North American market taillights are fitted, though the original European market lamps have been retained and are included. The windshield still has stickers from its life in Germany. This car is fitted with vacuum adjustable headlights, a cool option which allows the driver to re-angle the lights depending on the load in the rear of the car. As this example is fitted with heavier duty rear springs from a w123 wagon and a trailer hitch, this feature could prove useful. The seller notes some rust on the door bottoms and in the wheel wells, but no rust-through on the car. 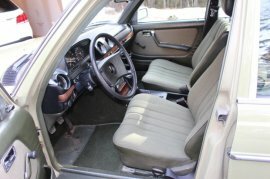 Green cloth seats were protected by covers for much of the car’s life and the seller says the upholstery is original and matches the door panels well. The rear seat has a fold down armrest. The vinyl surfaces on the door panels show some crinkling and looseness, but rips and other wear are not apparent. Windows are manual, as is the sliding sun roof. 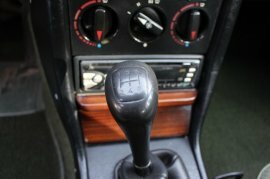 This example is fitted with a 5-speed manual gearbox, which the seller says transforms the driving experience compared to the automatic-equipped cars. The only interior modification is an aftermarket single-DIN head unit. 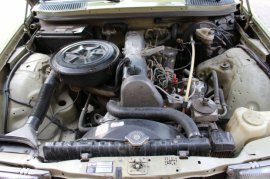 The 3-liter 5-cylinder diesel engine remains standard, though a higher capacity North American market radiator has been fitted by the seller, and a 75L North American market fuel tank was fitted by a previous owner. Per the seller this car was owner-maintained for much of its life. Before being purchased by the seller 8 months ago the car had a valve adjustment and oil change. The previous owner replaced the water pump and fuel pump (old parts included) and did a brake job. The seller has used the car for their 100km daily commute without issue. Though some rust is apparent at the edge of the wheel wells, as photographed the rest of the underside of the car and suspension hardware appear very solid. Per the seller the rear springs are heavier duty items from a w123 wagon. A box of spares left by the previous owner, including various belts and seals, are included and the European market tails can be included as well.